If you have the DIY genes, I love this sandbox idea you can make out of an old bookcase or cabinet. While it’s more ideal to use an old one you have lying around, if you can’t find anything suitable try going on CraigsList or OfferUp and see what you can find for the right price. All it takes is some spray paint and assembly and you’ll have a sandbox in no time. Who knew bookcases could be the perfect size for your children to play around in? Another inexpensive sandbox can be made out of an old tractor tire. These are for smaller (or fewer) children and so easy to put together. Simply measure and cut a circular plywood cover to lie on top and add sand! The kids can sit on the sides of the tire to play and you can control the use of the sandbox because it will be too heavy for them to move. You can spray paint the tire or leave it black, depending on how much work you want to put into it. If you’re looking to purchase an affordable, fun-size sandbox, Amazon has several different options that I love. One of my favorites it the hexagonal sand box because it has a rain cover and lining that makes it weather-resistant to last longer. The lining also stops weeds from growing through and is a very good size. The price ($80) is cheaper than most you’ll find unless you’re going the DIY route. Activity Sandbox with Canopy is a bit higher price point ($215), but includes a shady canopy to keep the kids out of the sun. It also has two plastic sand and water bins to keep the fun (relatively) organized and is large enough for multiple children to play in at once. If you want to really go all-out and your kids are into pirates, they’ll love this pirate ship sandbox. It has a steering wheel, a small canopy over the sand and storage compartments for keeping buckets and shovels in one place. This is one of my favorites if you’re willing to spend. 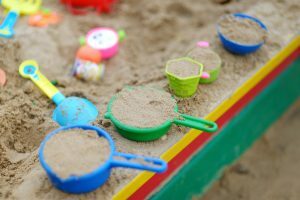 The most important factor in deciding what sandbox to buy or make is SAFETY. The last thing you want is for your child to hurt themselves in their fun, safe space while their imagination is running wild.